The convenience of a portable sprayerand the dirt busting power of a spin mop! Order Now! Click here to check the status of your order www.customerstatus.com. Please allow 24-48 hours from placing your order until it's updated in our systems. For customer service, please call 1-855-870-3717 between the hours of 8:00AM - 8:00PM EST. We are committed to providing the best products and friendliest customer service. If you should have any questions about ordering or a question about any of our great products, please feel free to contact us with the information provided. 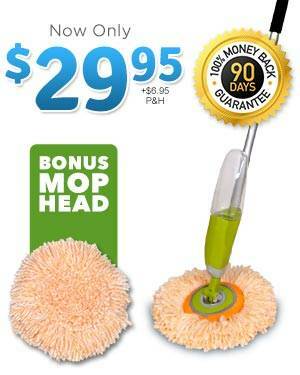 How many Shiwala® Spray Mop sets would you like? By clicking the 'Process Order' button you are placing a live order and agreeing to the terms and conditions and Arbitration Agreement..
Today, buy the Shiwala® Spray Mop with 2 mop heads for only $29.95 plus $6.95 processing & handling! Applicable taxes will apply to orders from CA, NJ, NV & NY. ©2019 Shiwala® Spray Mop All Rights Reserved.